During a months-long hacking spree that began in late-2012, Marcel Lehel Lazar breached the e-mail account of Dorothy Bush Koch, daughter of the 41st president, and several other Bush family members and friends. Included in the correspondence swiped by the now-imprisoned Lazar were exchanges regarding the medical condition of Bush, who was hospitalized in late-2012 with bronchitis. 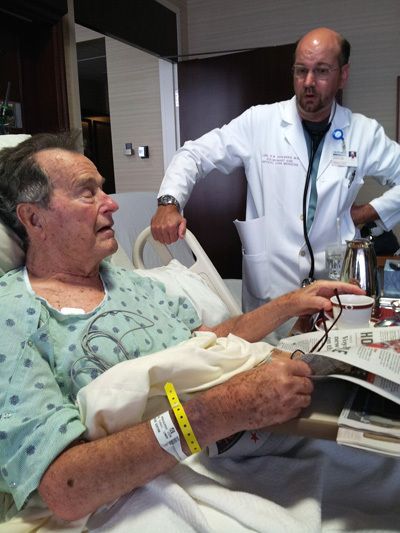 Bush, 88 at the time, spent two months recuperating in Houston Methodist Hospital. 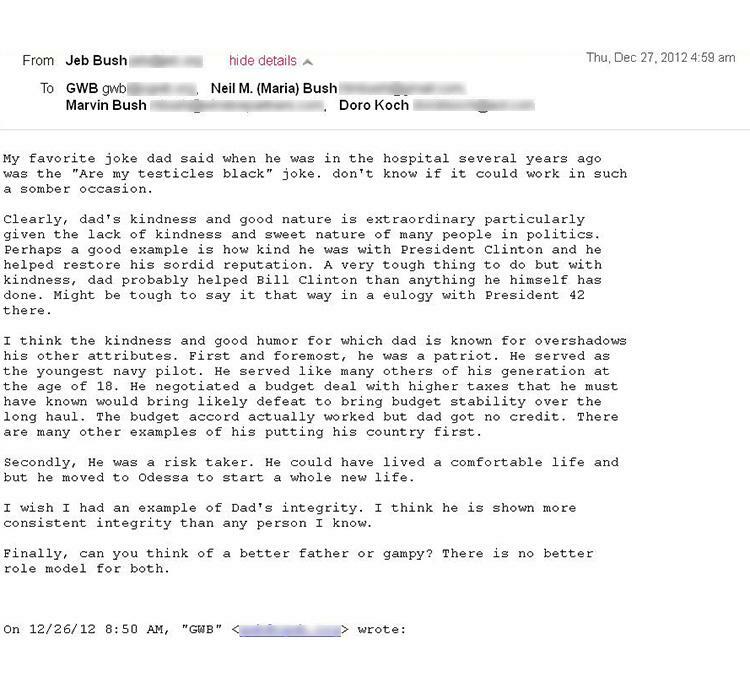 In a December 29 e-mail to her brothers George, Jeb, Neil, and Marvin, Dorothy relayed an encounter their father just had with a nurse named Claire. The former president asked Claire if his testicles were black, Dorothy reported. 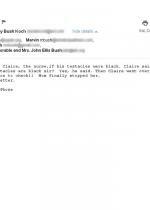 The nurse replied, “You think your testicles are black, sir?” “Yes,” Bush replied. The nurse, Dorothy told her siblings, then “went over and put rubber gloves on to check! !” But before Claire could examine the Republican octogenarian’s genitalia for discoloration, a third party stepped in. 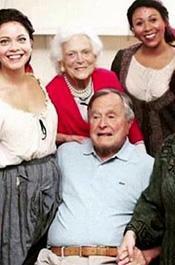 “Mom finally stopped her,” Dorothy wrote, referring to Barbara Bush, the former first lady (who was then 87). Two actresses this week told of being groped by Bush during photo ops at which they were standing next to the wheelchair-bound former president. Jordana Grolnick said that as she posed last year with Bush, his wife Barbara, and several other female performers, the ex-president asked the group, “Do you want to know who my favorite magician is?” Grolnick told Deadspin that, “As I felt his hand dig into my flesh, he said, ‘David Cop-a-feel!’” As members of the group laughed nervously, Grolnick recalled, Barbara Bush “said something along the lines of, ‘He’s going to get himself put into jail!'"